What a cool kids Bible! I love the 3D cover on the front! I think this would be great for a child aged from 8-12ish, it has lots of interest factors and background information to explain certain things in language a child can read and understand. I like at the beginning of each book of the Bible it is introduced telling who wrote it, if known and a summary and lessons we can learn and that kind of information. Another great feature of this Bible is that they have pulled out key verses that would work very well as memory verses that is in a section called 'Words To Treasure'. This really is a stunning Bible with so much interesting stuff in it! It has colored pages every so often with other information like listing the children of the Bible or How We Should Pray or Who Is Jesus. At the end it has maps and also a dictionary so if a child comes across a word they don't know they can check there and the meanings are written really clearly that a child could understand. 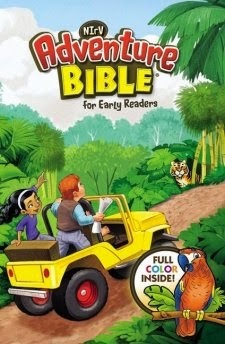 I would highly recommend this Bible to parents, grandparents or anyone looking for a really fun Bible for kids. It's not just a Bible, it's a self-educational tool around the Bible too. Please Note: Book Look sent me a copy of this book to review. This review is not influenced by anyone else - it is my own.